Published August 9, 2011 By Anna T. This post may contain affiliate links. Regardless, I only recommend sites I've researched and/or used and trust. Verbal Ink is a transcription company that used to go by the name of Escriptionist. They hire general transcriptionists to transcribe audio files from their homes. How much does Verbal Ink pay? The rate of pay is not disclosed on the Verbal Ink website. However, you're paid by the audio hour. This is typical for most transcription companies. If you apply, you may get an email back from them that does state the rate of pay. I did check Glassdoor, and most contractors that have reported their salaries say they average between $10 and $11 hourly. Another reviewer said most of the jobs that come through for them pay at around $0.85 an audio minute. The website says they are looking for “highly skilled transcriptionists”. They do not state how much experience you need to have, but some experience is required. Note that past experience is not always necessary to get started in general transcription. However, some companies (like this one) require it. Verbal Ink only hires residents of the United States to work for them. To apply, send an email to jobs@verbalink.com. You also need to include your cover letter and resume in Microsoft Word or PDF format to the email. They will not accept applications that do not contain a cover letter with the resume. If you hear back, you'll be asked to take a transcription skills test. Pass the test, and you should be in. After you are hired, you let them know in advance each week how much work you want/need to do, and they will try to accommodate you as long as that much work is available. There may occasionally be dry spells when there is little to no work available, so I'm not sure I'd advise you to depend on this as your only source of income. If you are able to get accepted to do work for Verbal Ink, you might consider applying to Quicktate or another company so you can turn to those for work when Verbal Ink doesn't have much for you to do. I have read that Verbal Ink is fairly selective, and many people who apply never hear back after sending in their resumes. Even though they accept applications all throughout the year, they are not always actively looking for new transcribers. After receiving your resume, they may put it on “hold” until they have a need for workers. What do people say about Verbal Ink? The only real complaints I've seen about Verbal Ink are from people who applied and complained that the test was too hard or that they were upset they didn't hear back. People who actually work for them seem very happy, and while many of them don't depend on Verbal Ink as their main income “egg,” they say it is one of their favorite companies to do work for. 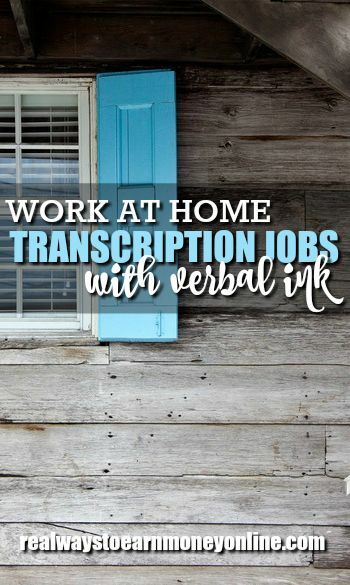 There are many transcriptionists who have been with Verbal Ink for several years, with no intention of leaving. You can see for yourself that this is a very highly-rated company on Glassdoor. Again, if you'd like to get your resume on file, send it along with a cover letter to jobs@verbalink.com. They also want you to let them know why you'd be an asset to their company, so be sure to include that in your cover letter. Please keep in mind that what I have posted is just a general overview of the company, and they may or may not be actively hiring right now. So by saying they require a cover letter, can that be included as text in the e-mail you send to them with your attached resume or do they want the cover letter as an attachment as well? The test is fairly extensive but not the most difficult I’ve seen in my time. They gave me two files each about 13 minutes, both with difficult audio and multiple people. You also have to know your way around MS Word. It was never necessary for me to do a lot of what they requested so I spent quite some time Googling Word help. They put as much emphasis on format as they do accuracy, grammar etc. There seems like there is really no room for error with them and they don’t let you know if you failed or not :\ fingers crossed. If Verbal Ink, Quicktate, and Scribie don’t work out, Verbal Fusion is another transcription services company to consider. Verbal Fusion also hires general transcriptionists to transcribe audio and video from home. Good post, Anna. I’m in the process of applying for different transcription companies, and was considering applying to Verbal Ink but was not sure. I will apply. I have a contract with Verbal Ink. Your starting pay is based on your experience level and the content of the audio file. You get paid more for files with average quality, poor quality, speakers with accents, multiple speakers, excessive technical jargon, etc. They are quite selective because your transcripts have to be flawless. I just got invited to take the test with Scribie’s. Listening to some of the audio’s I think this is a lot of work for just a $1 per audio. Are there some steps to make this process faster. I think textbroker is more easy to make a dollar with just writing a little. Any advice???? Katrena, you can probably make more with Textbroker if you are new to transcription. I don’t know for sure how you can speed up the process since I don’t do transcription myself, but I think other people have said that it’s something you eventually get faster at the longer you do it. Beginners are usually slower. So it might be worth sticking with if it’s something you think you would enjoy. I know that after you’ve gotten some experience, you can apply for higher paying transcription work. If I don’t meet Scribie’s requirements then I’ll give Verbal Ink a try. I think I would like to have a transcription job from home. It’s not as hectic as customer service.